One of the many benefits of the Nelson and Pade Grower Program is the personal visits to our growers by our senior staff. In late June through early July, Rebecca Nelson and John Pade took a tour around Lake Michigan, travelling 1700 miles to visit growers and potential growers in Wisconsin, Michigan and Illinois. The first stop was in northern Wisconsin to meet with a group considering a commercial aquaponics farm in a warehouse. This particular warehouse has excellent potential for an aquaponics farm. It was clean, insulated, heated and cooled. Plus, there are floor drains and a large, open room that will fit the new commercial 6-500 perfectly. Continuing on, we went to Carney, MI, where we visited the Miller Family Farm. The Millers run a diversified farm that produces maple syrup and they grow a variety of vegetables outdoors and in hoop houses. Their 6-500 Clear Flow Aquaponic System® is in a controlled environment facility, with the fish and filter tanks in an insulated building and the plants in a connected greenhouse. This is a very well-run aquaponics enterprise with every detail attended to, right down to successful marketing. It is rewarding for us to see our growers successfully growing and selling their aquaponics crops. And, enjoying the lifestyle along the way. Leaving Carney, we ventured over the top of Lake Michigan, crossing the Mackinac Bridge into northern Michigan from the Upper Peninsula. We drove down the eastern shore of Lake Michigan to Traverse City where we met with another potential grower. Traverse City is a beautiful beachfront community that caters to vacationers year ‘round. There is an excellent market for the fish and vegetables grown in an aquaponics farm. The individual we met with will likely be installing a 6-500 Clear Flow Aquaponic System® to fill the demand for fresh, premium quality fish and vegetables in Traverse City. Leaving Traverse City, we dove southeast to Robin Hills Farm in Chelsea, MI. Robin Hills Farm is a destination farm in development. The farm is on a 160 acre parcel that includes an organic Community Supported Agriculture program, fishing ponds, organic sheep farming, a soon to be completed wedding barn and a greenhouse which houses a Family Farm Market Clear Flow Aquaponic System® and an area for classes and teaching. The team was finalizing the last details of the installation of the aquaponic system when we arrived. It was a great opportunity to discuss the water flow and intricacies of the system prior to filling it with water. After visiting Robin Hills Farm, we drove through southwestern Michigan, northern Indiana and then into Illinois. We maneuvered through the Chicago traffic to stop at Metro Farms near the intersection of Cicero and Chicago Ave. Benjamin Kant and Shockey Funke have created a green food oasis in the middle of a concrete jungle. It is very inspiring to see the completion of this project after lengthy bureaucratic and regulatory issues. Metro Farm’s 12,000 sq. 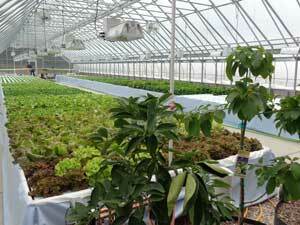 ft. greenhouse houses a 6-800 commercial Clear Flow Aquaponic System®. It is stylishly finished with a great attention to detail and functionality. Benjamin shared that he loves coming to work every day, enjoying the space they’ve created and nurturing the fish and plants. 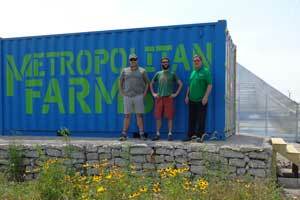 With plans for expansion, Metro Farms will have a positive impact on the availability of fresh food in Chicago. It was an excellent trip and wonderful to see our clients doing well and enjoying life as successful aquaponics farmers. Stay tuned for details on the next Grower trip! Author Ali Berlow holds book talk and signing at Nelson and Pade, Inc.
On Saturday, July 18, 2015, Nelson and Pade was honored to host Madison, WI native and author Ali Berlow. Ali Berlow is the author of The Mobile Poultry Slaughterhouse and the co-owner of Edible Vineyard, and she has been writing professionally for more than 10 years. She got her start in 2002 with the NPR essay series A Cook’s Notebook. Nine years ago Ali founded Island Grown Initiative, a grassroots nonprofit on Martha’s Vineyard. Under her leadership and vision, Island Grown Initiative launched many of the types of project and ventures described in her newest book, The Food Activist Handbook: Big & Small Things You Can Do To Help Provide Fresh, Healthy Food For Your Community. During the book talk and signing Ali shared with the crowed the tools and knowledge on how to make a difference, even in a small rural area like ours in Montello, WI. Become engaged. Use your voice. Big change can start with just one. Ali’s book sparked action within our community to begin mapping out where in our county local food can be found. Find out more about the big and small things you can do within your community and beyond with the guidance of Ali’s book. You can purchase a copy through our online store. On Tuesday, July 15, 2015, we were honored to have a visit from the Wisconsin Lt. 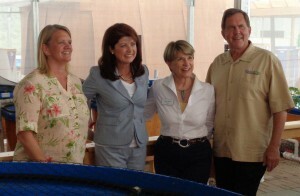 Governor, Rebecca Kleefisch, who was accompanied by UW System Regent, Regina Milner. John Pade, UWSP Professor Dr. Chris Hartleb and I gave the tour of our new greenhouse facilities and the UWSP-Aquaponics Innovation Center. 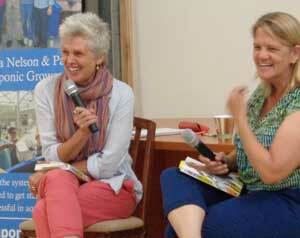 We were thrilled and honored to host this tour and to spend time with these two dynamic women. They were genuinely interested in the achievements of our company and the paths we have created for people around the world to achieve food sovereignty. Lt. Governor Kleefisch especially appreciated the healthy nature of what we do and grow, noting that fresh fish and vegetables grown without chemicals, pesticides or herbicides, are an ideal diet. It is inspiring to see the Lt Governor’s willingness to learn about and understand the businesses of Wisconsin. In our case, we relocated from California in 2006 to grow our business in a state that was “Open for Business.” At that time, it was just John Pade and I (Rebecca Nelson). In late 2009 we purchased our current business property, which we occupied in early 2010. With just 2 employees then, we could see the potential for considerable growth for our company. Now have 22 employees and a global customer base. The Lt. Governor thanked us for returning to Wisconsin to grow our business and for bringing people from around the world to attend our training classes in Montello, WI. The economic impact of our efforts in Wisconsin were not overlooked. Another important factor recognized was the partnership that we have established with the University of Wisconsin-Stevens Point, which has launched new educational and research opportunities that will have far reaching, positive impacts on the aquaponics industry. Regent Milner is a proponent of aquaponics and this public/private partnership. 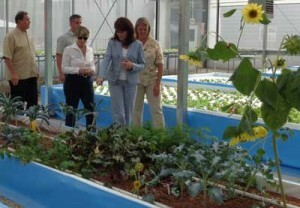 This was her second visit to our facilities and the new UWSP-Aquaponics Innovation Center, located in our greenhouse. Regent Milner was very interested in the research aspect and opportunities that the UWSP-AIC is providing to students. Our partnership with UWSP was launched several years ago when, together with UWSP Professor of Biology, Dr. Chris Hartleb, the first University-level aquaponics course in the world was developed and is now offered every year at UWSP. We do appreciate the Lt. Governor and UW System Regent Milner taking time out of their very busy schedules to visit us in Montello. Last week, a small cadre of Wisconsin Sea Grant communicators visited an aquaponics facility in Montello, Wis., to learn more about this intriguing way to grow food. The types of food involved are fish and plants – walleye and tilapia, and just about any type of veggie one can imagine. This alone would be cool, but what’s even more notable is that the water used in the system is recirculated and reused, thanks to the wonders of bacteria and a specialized filter system. The facility houses joint operations by Nelson and Pade Inc., and the University of Wisconsin-Stevens Point. 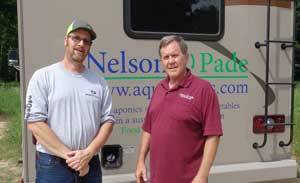 Nelson and Pade sells aquaponics systems commercially, along with the fishy and veggie fruits of their labor. They also provide aquaponics classes and training in their system. 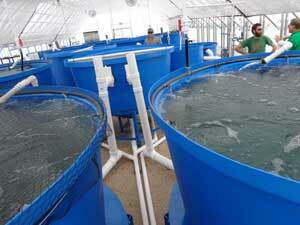 UW-Stevens Point conducts research into new aquaponics methods. The day we visited, the UW staff were excited for an impending delivery of walleye for their system from their sister program, the Northern Aquaculture Demonstration Facility in Red Cliff, Wis., for which Wisconsin Sea Grant provides staffing support. 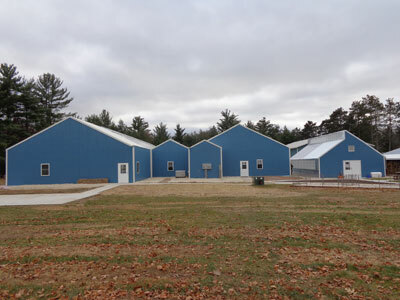 A full year has passed since we embarked on a major expansion of our facilities in Montello. It has been a whirlwind of activity over the past 12 months, from destruction to construction, assembly of new aquaponic systems and completion of 14,000 sq. ft of new greenhouses and a 6,000 sq. ft new manufacturing building at our Montello, WI business campus. This all culminated with an extravagant Grand Opening in April. The Grand Opening celebrated the public/private partnership between UW-Stevens Point and Nelson and Pade, Inc., our new greenhouse facilities and the new UWSP-Aquaponics Innovation Center. The next event is our July Aquaponics Master Class, which takes place in our new greenhouse and 1200 sq. ft. classroom. We welcome a diverse mix of International attendees in every one of our Master Classes. In July, our class will be at full capacity with attendees from throughout the US and Canada and the islands of Bermuda and Puerto Rico. We have an abundance of new commercial projects in the works for the latter half of 2015, in locations ranging from California to Malaysia, Texas to Canada. It looks like it will be a very busy fall at Nelson and Pade, Inc. as we continue our goal of helping people get started and become successful in aquaponics. Keep up to date on our daily activities on our Facebook and Twitter pages!